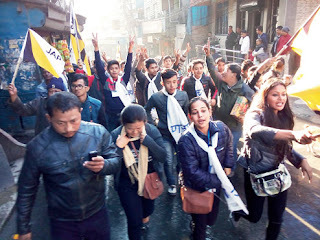 The Jana Andolan Party tasted its first electoral success today with the Jana Andolan Students' Union (Jasu) winning the Kalimpong College polls by dislodging the Vidyarthi Morcha. This was Gorkha Janmukti Morcha's first defeat in campus elections since its formation in October 2007. The JAP students' wing won 12 of the 22 seats in the union. The Morcha bagged the rest. The Trinamul Congress which had contested in 17 seats drew a bank. In Kurseong College, where union elections were held today, the Vidyathi Morcha managed to retain its hold winning 15 of the 22 seats. Trinamul-backed Independents bagged six seats and there was a tie in a seat between the Vidyarthi Morcha and an Independent.